It's official. I'm renouncing my status as a Halloween Grinch. Halloween used the be THE WORST holiday ever. I mean, I guess spending time and money on a costume you wear once is supposed to be fun? And candy is good? And I'm always down for celebrating the ghosts of the dead returning to Earth for one night of terror. But really, Halloween was the holiday to get through so the real holiday season could start. But now, almost against my will, my Halloween heart grew a few sizes. And it's all because of my squishy toddler. It's fun seeing the holiday through her eyes. Costumes! Candy! Fun! Prancing around with wings on! What's not to love? This year, I present my little desert ladybug! She loves the wings, and wore them around the house for two hours yesterday. We sure like her! 2. Measure how long you want the skirt. I did 8", which turned out to be the perfect length. Double that number and cut the tulle in strips of that length (my strips were 16" long each). 3. Measure out the waistband. I totally eyeballed it, and left a few inches on either end just to be safe, and it turned out fine. But if you want to be more precise, measure around your child's waist and then add two inches on either end. 4. 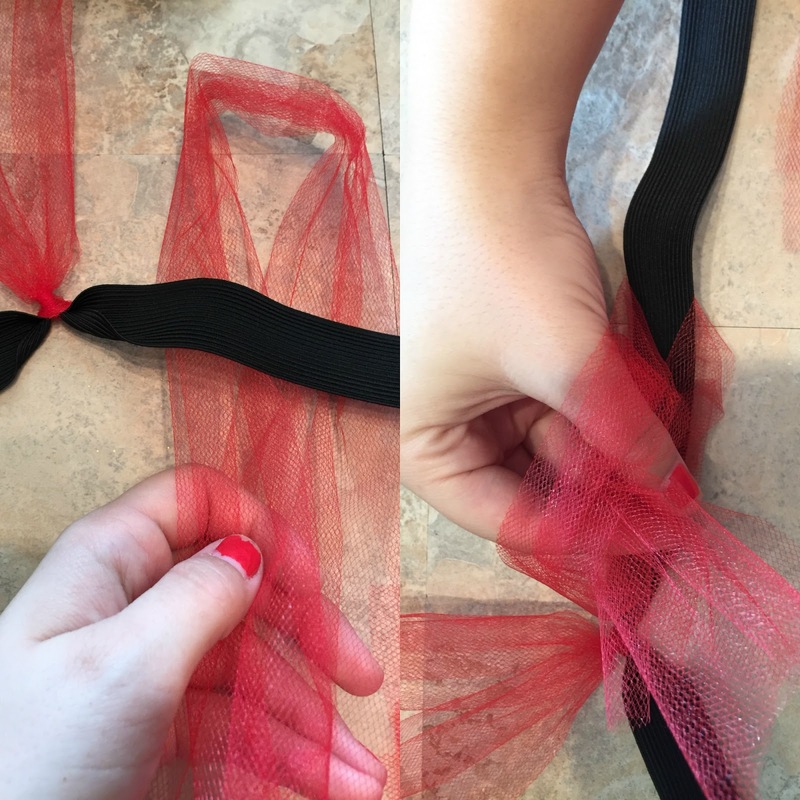 Make the red skirt by folding each tulle strip in half, placing under the waistband, and then pulling the ends of the tulle through to make a knot. Do that same process for the rest of the tulle. IMPORTANT: Make sure you pull the knot in the same direction each time. If you switch sides, half of your skirt will be pointing up and half will be pointing down. 5. Turn the sticky-back felt over and trace circles on the back. (I used a cup for about a 3" diameter.) Cut out the circles, peel off the sticky back, and place each circle on the skirt. Press them into at least two layers of tulle so it sticks fully. 6. Secure the waistband and you're ready to go! 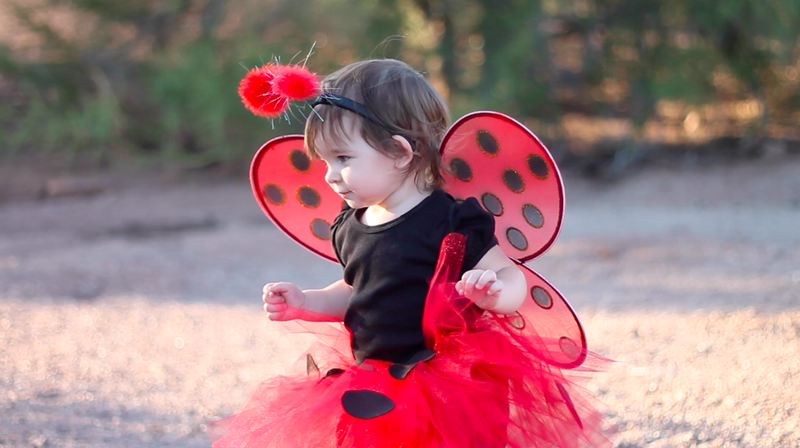 AND, just for fun, we made a little video of Claire prancing around the Arizona desert in her costume. Let me just say, we are NOT good at home videos yet! Not by a long shot! Sam and I were laughing at how shaky everything is, and the three black smudges on the lens. But hey, we're not going to get better if we don't keep at it, right? 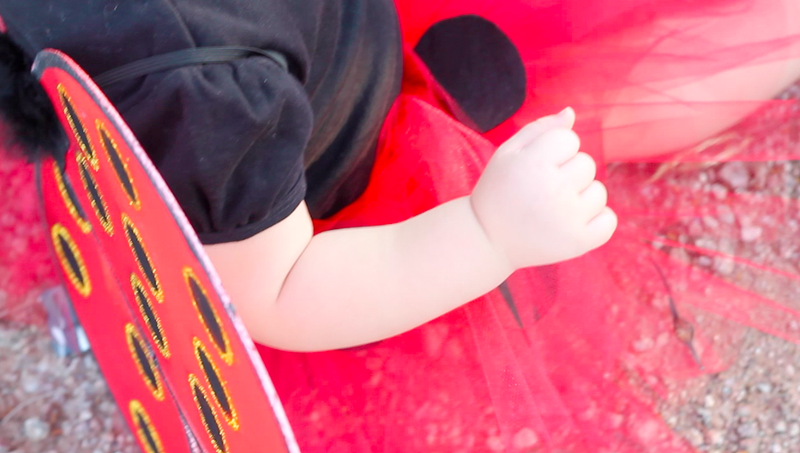 So excuse the amateur quality and enjoy her cute ladybug costume!